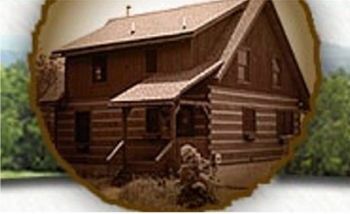 Surrounded by New Germany State Park, O'Harra’s Hundred is a three-level log home situated on four private acres with a spectacular panoramic view on the Allegheny Mountains which stretch southwest as far as the eye can see. Designed as a family retreat, the four year old home is a perfect location for families who love tranquil days with beautiful sunsets, and the overall peace and serenity offered by the great American outdoors. Just outside the door awaits the full array of birds and animals native to the Maryland mountains. The winter cross-country skiing is terrific and the groomed trails in the surrounding park are maintained throughout the winter. After any winter outing nothing is more cozy than sitting in front of the stone fireplace reliving the day’s activities and renewing the many joys of being with family. The spring, summer and fall offer boating, biking, hiking, swimming, picnicking and some of the very best native trout streams east of the Mississippi. Antiquing, arts and crafts, museums and fine dining are all near this cozy little getaway. Surrounded by New Germany State Park and the Savage River State Forest. Situated on 3.5 acres. Elevated 30 ft. covered deck with vast mountain vistas (about 25 miles). Books, games, puzzles, ping pong table. Terrific trout fishing, white water rafting, cross country skiing, hiking, biking and more. NON-SMOKING CABIN BUT PETS ARE ALLOWED!!! Please visit our other website for additional information and photos.